PVA-600+ refurbished PV Analyzer Kit is a 600 volt I-V curve tracer with built-in PV performance modeling and the SolSensor advanced wireless irradiance, temperature and tilt sensing. It provides unprecedented measurement throughput and accuracy and delivers deep insight into the performance of your arrays. For higher voltage or current curve tracing see the PVA-1000S or the PVA-1500. For each string, the PV Analyzer measures the I-V (current vs. voltage) and P-V (power vs. voltage) curves with a single button click. The measured results are compared to the expected performance, taking into account the irradiance and module cell temperature at the time of the I-V measurement. The I-V Unit communicates wirelessly to your Windows tablet or laptop (not included), enhancing safety and allowing freedom of movement during testing. Automated data analysis and reporting save you time. The PV Analyzer is designed to work as hard as you do. High measurement throughput means it can measure 1 MW in less than 2 hours--even in hot environments where other curve tracers shut down. The rugged enclosure is moisture and dust resistant. The incident angle corrected SolSensor is able to make accurate irradiance readings in lower light conditions extending your working window. I-V curve testing is the preferred method for commissioning, O&M, and troubleshooting of PV arrays because it provides the most complete performance measurement possible. Populations of curves can be analyzed quickly for outliers and data can be archived as a baseline for future reference if performance questions arise. SolSensor Wireless PV Reference Sensor (included): Irradiance, module temperature, and tilt readings are captured at the instant the I-V curve is measured. Improves effectiveness of expected performance models. The SolSensor has a range of more than 300 ft and includes a module rail clamp and precision mounting system for POA alignment. Measures and displays I-V and P-V curves and key parameter values. Advanced built-in PV models provide immediate PV performance checking. Database of more than 50,000 modules, with automatic updates. Automates data management, analysis, and reporting. Measures string-after-string, combiner-after-combiner, without overheating or slowing down your measurements. Clear, colorful, touch-capable software runs on your tablet or notebook PC, providing rich insight into PV performance. Accurately measures high-efficiency modules and strings. Wireless interfaces for faster setup, safer work environment, and freedom of movement during PV troubleshooting. 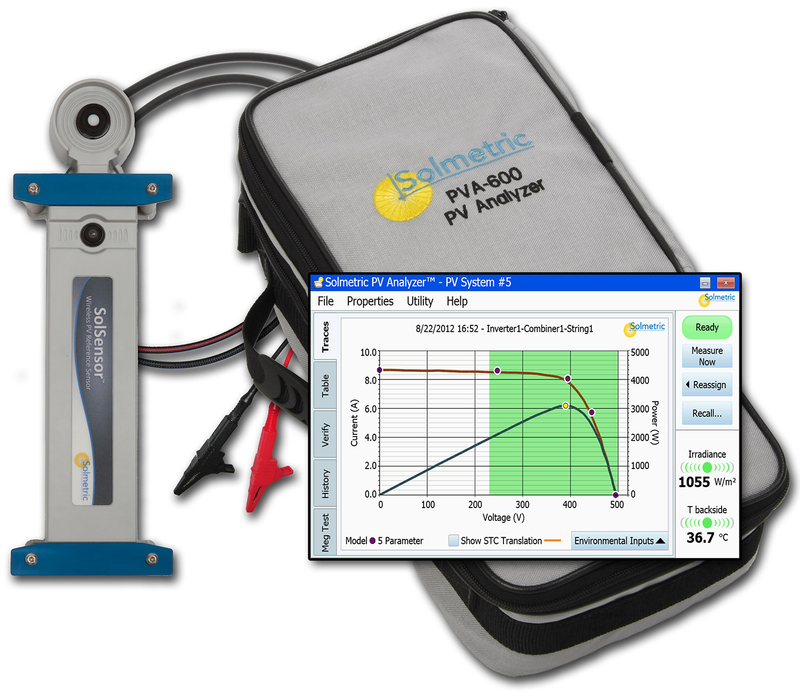 The PV Analyzer requires a Windows laptop or tablet that is not included with a PVA purchase. Minimum requirements and recommendations are given below. An extended life battery, swappable battery, or external backup battery is convenient for full days of testing (a 4MW system can take 8 hours to measure every string. For extreme, hot, or dusty environments we strongly recommend the Panasonic Toughbook or similar. Systems that do not meet these requirements may not operate correctly.